The motorsport enthusiasts in India can get ready to rekindle their love-affair with the sport, as Honda Motorcycle & Scooter India Pvt. Ltd. (HMSI), unveiled the road-map for an action-packed season’16. In a bid to promote motorsports at the grassroots level, and to offer opportunities for talented prospects to develop a career in the sport, Honda today announced a Help Line number – 0124-6712863. Under this unique initiative, any rider who wishes to take-up motorsport professionally, can reach out to the Honda Racing Team on through this Help Line. 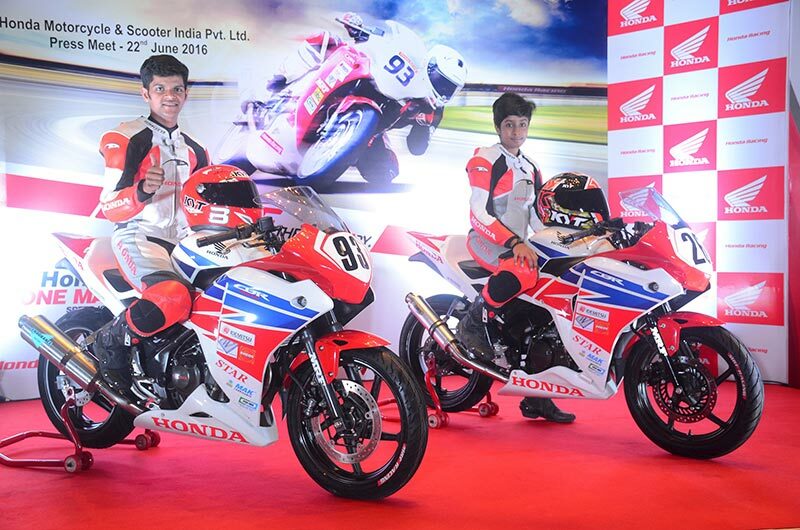 The deserving candidates will then be given training on the nuances of two-wheeler racing at the Honda Ten10 Racing Academy. Honda will also provide all technical support as well race-prepped motorcycles to all the aspirants. The ninth edition of the Honda One Make Race, to commence from June 24 onwards, marks the beginning of the motorsports season. Since its inception in 2008, the Honda One Make Race has grown by leaps and bounds, in both scale and prestige. Motorsport has been in Honda’s DNA from the inception. There is something about motor racing that grabs the imagination of almost everyone. At Honda, we are delighted to announce the launch of our Help Line – 0124-6712863 through which we will be able help youngsters dreaming about a career in motorsports, actually achieve it. This year, the biggest highlight will be the first-ever full-fledged season of the Honda All Women Race. In a step towards encouraging more women participation, Honda had conducted the first-ever All Women Race during the Round 5 of 2015 season. Building on the success, 10 women riders will compete in the First Round of the Honda exclusive women racing event. 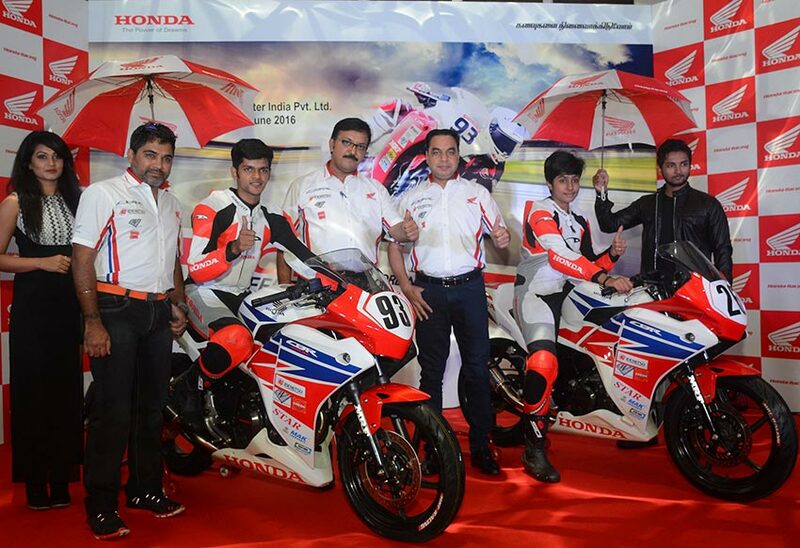 The woman riders have been trained at the Honda Ten10 Racing Academy. It is always Honda’s endeavor to bring new categories and excitement into the race. Following an overwhelming response from participants, and support from the motorsport fraternity, we are pleased to announce a full-season of Honda Exclusive Women Race. Meanwhile, both the CBR 250R and the CBR 150R categories, continue to emerge as a nursery for young talent to showcase their potential. For this year, Honda unveiled new race-prepped racing versions of CBR 250R and CBR 150R. Developed with technical know-how provided by Honda’s Indian R&D team, both the motorcycles are set to scorch the Kari Motor Speedway, beginning this weekend. The new racing version of the CBR 250R gets an upgraded Honda racing kit, including wiring harness with remapping option, advanced racing body cowl kit & equipped with endurance exhaust. The new CBR 150R gets a reprogrammed ECU & Endurance exhaust. Honda has received over 53 entries from as far as Mizoram, Ahmedabad, Ranchi, Aizwal, Jalgaon, Pune, Hyderabad, Bangalore, Trichy and Aoroville. Like every year, the CBR 250R category will be conducted as a Team Championship; wherein 16 CBR 250R performance bikes have been leased out to 4 teams registered at FMSCI. Besides defending champions – Ten 10 Racing, Prolap Racing, United Tech Torque and AMB Tuning will compete for the top-honours. The CBR 150R category will be an open category where riders, who have undergone extensive racing training from Honda Ten10 Racing Academy or any other training school recognized by MMSC (Madras Motor Sports Club) will vie for the top-spot. Furthermore, 10 Honda Racing motorcycles will also be seen in the National Championship after 6 motorcycles were leased to Ten10 Racing team and 4 motorcycles to Pro Laps Team. The year 2016 is set to be a landmark year for motorsports in India as racing aficionados of the country will be able to witness international level action. The Round 5 of the Asia Dream Cup is scheduled to be held at the Buddh International Circuit, Greater Noida, from September 29-October 02, 2016. I am thankful to Honda for not only giving me an opportunity to compete with international riders, but also for investing in us. The last one-year has been a huge learning curve. Our success in the Asia Dream Cup is testimony to the support and training we have received from Honda. It has always been a dream to represent India on international-stage, and to be able to do in in front of our home-crowd will make the occasion even more special. The BIC-leg presents us a golden opportunity to make a mark for ourselves internationally and in India. Besides announcing the return of the 2016 season, Honda racing team also announced the dates and venues for the 5 sessions of for Honda Ten 10 Racing Training Academy. The HTRA offers an opportunity to participants to blossom their talent and build a career in motorsports. Indicative of the rising interest and popularity of motorsport in India, the training session typically receive received participation from 20 two-wheeler racing enthusiasts, spanning between the age-groups 17 to 30; from various parts of the country including Chennai, Hyderabad, Ambala, Pune, Guwahati, Mysore, and Bengaluru. Post the session, Honda Ten10 Racing Academy issued the Level 1 certificate to participants, rendering them eligible to participate in two-wheeler road racing championship organized by Madras Motorsports Club.